Another week on Big Brother 2014 comes to an end tomorrow night with the live eviction show and we will see the reign of Christine end for Week 7 on Big Brother 16. 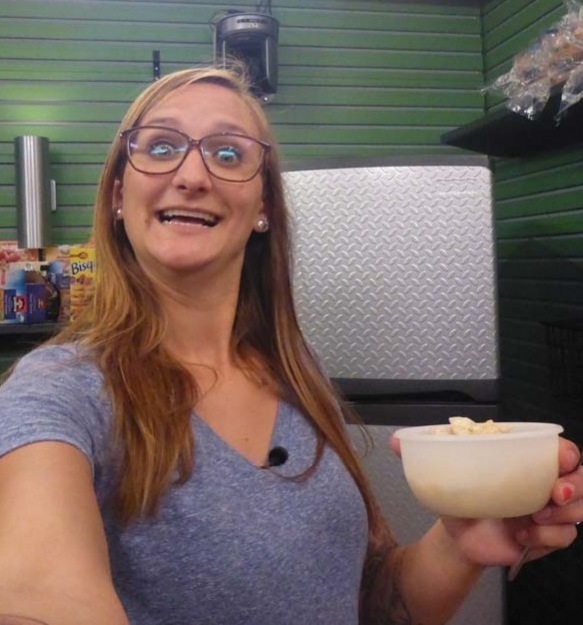 Before that happens, she has to write her HoH blog and take some photos with the HoH camera! It is interesting to see what these people write in their blogs and see what is actually going through their minds when decisions are made. Check it out below in our Big Brother 2014 spoilers! I will admit that I started with good feelings on Christine this season and thought she might do well and that I might like her. She partnered up with Nicole and I liked her even more, even though she was truly aligned with the guys. She talks about having so many alliances this season in her blog and even being worried about no one wanting to be in an alliance with her when she was headed into the Big Brother 2014 house! You also get to see some videos of Christine answering a few questions, so check it out here! I would agree with that Todd. But her ugly game play makes me over look it sometimes. She has been particularly cruel to Nicole this week – blaming HER lies on Nicole and more. NOT a fan…. Todd your kind, but she has a banana nose. It’s just the picture here Todd that is woof, it doesn’t do her justice at all. Those faces they all insist on making are not funny or cute at all. Just my opinion. I just can’t with this girl. To me her game is sleezy. In the beginning i thought she was a smart girl. But now i think she is being led to slaughter by the guys. She’s missing the obvious signs that she is on their radar. Plus her relationship with Cody is questionable. The other day Nicole said at one point she thought maybe Christine and Cody were secretly married outside the house because of the way she’s always touching him. She calls him her best friend in her blog. Well i have a lot of guy friends myself. But laying all over them and stroking their hair would be a definite no no to my significant other. I blame Cody just as much as her though. He KNOWS she’s married yet he does not discourage her from doing it. He likes the attention. And i’m sure he thinks he can control her vote because of this. I’ve lost all respect for her as a person. And even more importantly to me as a fan – i’ve lost all respect for her game. Great synopsis BBCat … thanx! I’ve never been on the “Christine is ugly” bandwagon. She certainly wasn’t one of the beauties of this season, but I think of her as more “simple” looking. Not a natural beauty, but could be more attractive with different glasses and a different hairstyle. These currently just call attention to her nose, which is her least attractive feature. That said, I think her blog was insightful. I don’t agree with her delusions, but it shows where her head is. She honestly believes that these game moves are “nothing personal” (Sorry, Christine, but Nicole wants nothing to do with you outside the house; this week was personal for her.) and this is “a marathon not a sprint.” Problem with that theory is that – after Nicole and Donny leave – she’s low man on the totem pole, and then who will she align with? She’s done her own enemies’ bidding by helping them vote all her possibly allies out! One thing is crystal clear to me: Being in that house and watching the game from outside are two very different things. I’m not sure you can exist very long in this game – especially anymore, if you ever could – by being a decent person. Look at Donny. He’s tried to play with decency, and he’s not only about to get voted out, he’s ostracized in the house. This game REQUIRES people who either already have low scruples or who are happy to check them at the BB door. I’m not sure I’ll ever enjoy the game again because I don’t know that they’ll ever have more than one or two people in the house that I respect – and they’ll get voted out by mid-season. Donny has done well, indeed. Sorry – guess I’m feeling cynical this afternoon! Christine is probably very aware she is no beauty queen and won’t attract men or get them to like her with her looks or sexuality so she’s probably decided to win them over by being funny, acting like a clown and doing whatever they want her to do. Sorry, Christine, that isn’t going work either. You are being used and will be tossed out as soon as they don’t need you anymore. I cringe every time I hear her distinct giggle/laugh … UGH! BB actually won the ratings war Sunday. Even though they had a late start that night. And Thursdays shows are always winning the ratings also. Mainly because it’s eviction night. Not sure about Wednesdays. Ratings last year INCREASED after the crap hit the fan over the racist/bigoted comments. Every one wants to see a train wreck. But i do agree with you that this season is going down the tubes fast. Not sure they can save it. But one thing is obvious to me. They are not listening to what the fans want. This is similar to the phrase, “you can’t prove a negative” – kinda. What I mean is, they think these gimmicks (even controversies) are what bring viewers when in fact they have a core of die-hard fans who just keep hoping they will get back to what made the show great. Until someone over there actually LISTENS to the fans and takes a leap of faith by correcting these casting decisions, we’re stuck with this product. Until enough of us get ticked enough to leave, and then they just shut it down. Without ever trying what we believe would work. Totally agree. There is one thing that confuses me though. I watched Big Brother Canada last season. And they were head and shoulders above BBUS this season (and definitely last season). And they have the SAME casting directors. WTH??? They must know that we would like to see some of the twists they implemented for BBC. How could they not? Who knows? I’m beyond figuring these morons out. Remember, they can’t even catch the misspelling of DonnY’s name on their primetime television screen!! The only reason people watch this show is that NOTHING else is on in the summer. It is like white noise. This year is the worse. First BB production focused on Frankie and it became the Frankie SHOW. After people complained that this was making them gag, they switched to others. I’ll accept this year is the most boring, with too-predictable gameplay. But last season was by far the worst ever. On every level. I agree Lilly, but this one is a very close second. I’m surprised the ratings haven’t plummeted. I didn’t see Victoria or Nicole in any of Christine’s pics. Did I miss something? There’s only one pic that Nicole is in. And she’s sleeping. Cody is bending over the bed giving her a weird look. Other than that, most of them contain Cody (her house husband). Where’s a pic of Victoria? Was she sleeping? Putting on her makeup? What’s the excuse for excluding her Christine? She has made a fool out of herself; petting, cuddling and fawning over Cody, who would not even give her a second look on the outside. How embarrassing for her husband and family to see what a troll she is. Game what game, being a leech and following instructions from the real brains in this game. I hope you can return to your “barista” job. One day after BB is off the air, they will say Christine WHO????? Exactly Cadee, she is nothing but a goggle puppet. Makes me sick. CBS has this show rigged it is not even funny. We all know who they want to win Frankie,. You can tell when you hear Julie talk to him. What BS, why even have the show. I hope next year it is cut. Cody would go so much further if he would get away from those other people. I forgot about Cody. Now I do like Cody. Him and Donny are the ones I like. Ugh! I have such dislike of Cody. Ever since he told the others about dancing half naked for married women. He was proud of the fact that he made their husbands so jealous. Plus his need to let Christine fondle him. Doesn’t look right for either one of them. Plus he’s the one who said Donny had to go because he (Cody) just couldn’t stand listening to him talk anymore. Instead of him hating how Donny talks maybe the AH should learn morals from him. It looks worse for Christine. Isn’t she married? Why is she laying in bed with him fondling him anyway. Why are any of these married people doing this on tv. Did they forget they have to go home to their spouses? Donny said it best. He has never seen anyone married act like this, she is nothing but a sl…t looking for money. She is a ho. And if I were a man and she was my wife, her clothes would be on the porch when she got home. Here to, we think allot alike. Cody? Who’s Cody? You never see or hear anything about him. Nicole’s departure was a sure thing for most, if not all, of this week. But CBS ALWAYS edits things to make it look like these boneheads were actually considering her arguments. I WATCHED the convo where Nicole tried to convince Cody. It was painful to see because it was so obvious Cody was just listening to be polite. There was ZERO chance the vote was gonna change once Christine blindsided her. Right on Cadee! I so agree!